I loved the new biography of Mick Jagger that suggested he has a proper English breakfast complete with soft boiled eggs from a Wedgewood egg cup. For some reason, that seems delightful, gentlemanly, and proper. 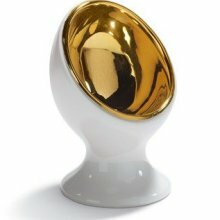 Herewith, a more beautiful egg cup from LLadro, $110.00, for Sir Mick. Who says you can’t get no satisfaction in this world?